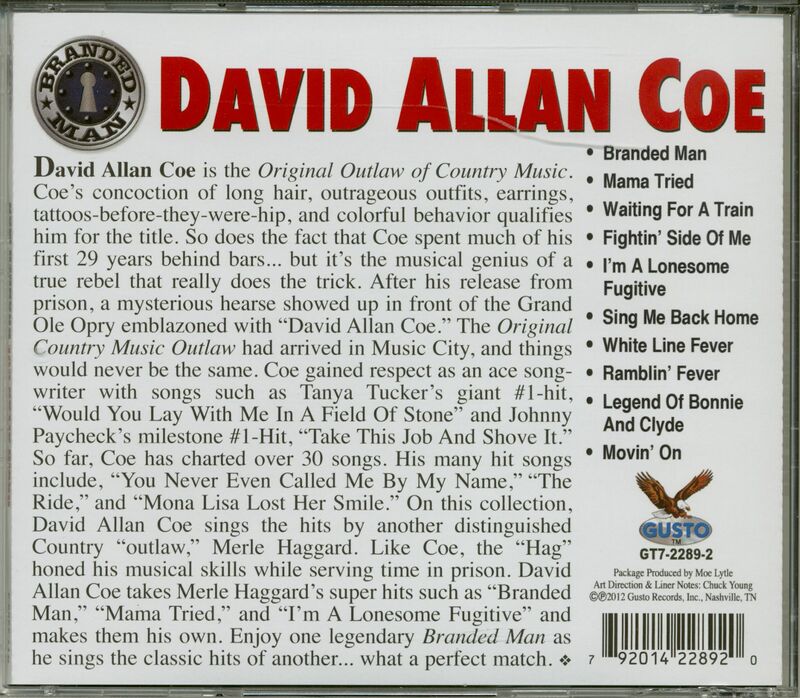 David Allan Coe on Bear Family Records We are truly proud to be the only label to offer Coes best recordings in this comprehensive form. 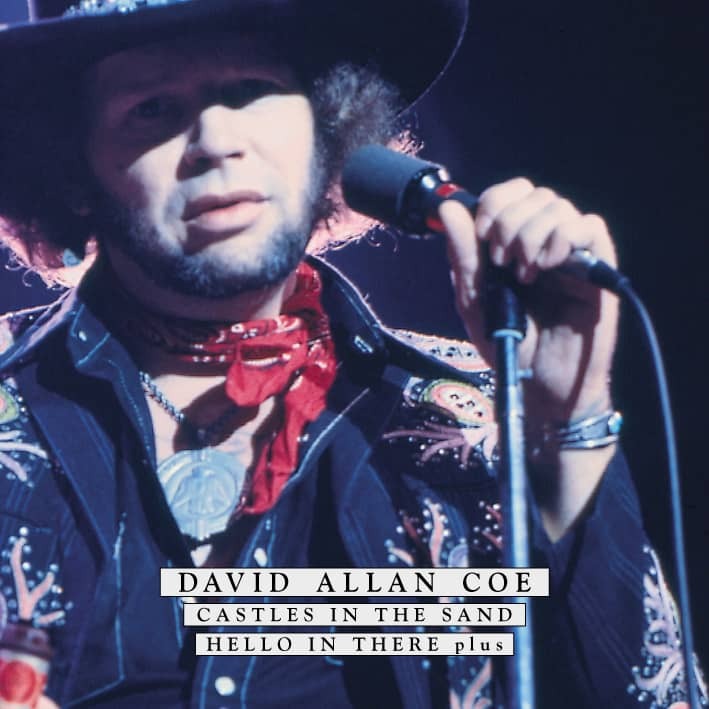 (Bear Family Records) David Allan Coe The eternally rebellious outsider is one of the most dazzling and unpredictable artists in country music and the entire music scene. 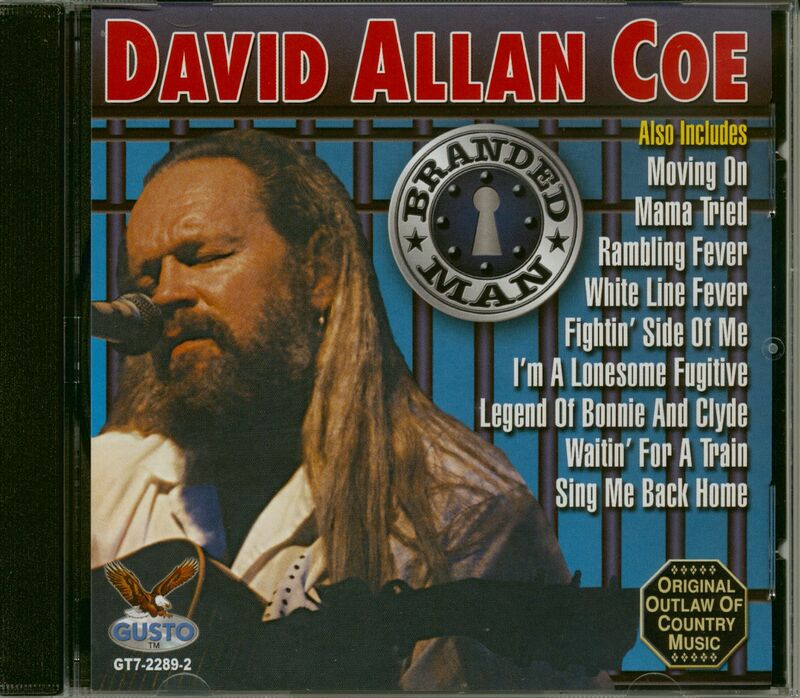 A pioneer of the outlaw movement, David Allan Coe himself had no hits, but wrote several for other performers, including Would You Lay With Me In A Field Of Stone and Take This Job And Shove It. Coe was hyperactive: During his 13 years with Columbia he released two albums almost every year. Castles In The Sand' and'Hello In There' were released in 1983 and critics agree:'Castles In The Sand' is one of the most underrated albums of its time - and one of the most unusual. Coe wrote only three songs for this album, and co-wrote another one. The title song is dedicated to Bob Dylan, one of the two most misunderstood artists of her generation - the other is Coe herself. David Allan Coe imitates Dylan's voice during the complete verses and sings the choruses with his own. Title 2 is a funky version of Dylan's Gotta Serve Somebody, recorded with Lacy J. Dalton. Another highlight is the eerie cover version of The Ride, a No. 4 country hit from 1983, in which the spirit of Hank Williams appears to offer his help. Hello In There runs on two tracks: Province & City. Once again David Allan Coe mixes his own compositions with cover versions and excavations that reflect his feelings at that time. Play tips are Hello In There by John Prine, Jerry Butlers He (Will Break Your Heart) and Gotta Travel On by Billy Grammer. Epic self-mythologist David Allan Coe arrived in Nashville on November 3, 1968, one year and one day after his release from Marion Correctional Institute in Ohio. He signed with music publisher Audie Ashworth, who'd just signed J.J. Cale. After trying to land a contract for Coe without any success, Ashworth encouraged him to get a day job. Coe resisted. "If you get a steady job you start living like citizen people," he said. "You run up debt, and then you need the steady job to pay off the debt." And so Coe stayed with friends and got by on little. "Columnist Jack Hurst was the guy that really got me started," said Coe. "He'd seen my car, the hearse, parked down at the Grand Ole Opry. He come down, wrote a story about me." Hurst's piece piqued the interest of producer-label owner Shelby Singleton, who was flush with money from Harper Valley PTA. With that money, he bought the old Sun Records catalog, and along with the Sun tapes came a would-be producer from Memphis named Teddy Paige, who'd been in one of the last acts on Sun, the Jesters. "I talked to Coe," said Singleton, "and he told his stories. He wanted to be a country singer. I said, 'Lemme hear something.' He started singing all these songs about prison life. I said, 'Hell, ain't none of them songs country.' He said he had hundreds more prison songs up in Ohio, so I give him and Teddy Paige two hundred dollars and told them to bring 'em back." This was the only song on Coe's first LP that he didn't write or cowrite. It was the work of one of Ashworth's songwriters, Hank Mills, who'd written the best song ever about Nashville, Kay. Like the rest of the LP, it was set to an insistent Jimmy Reed beat. Coe went on to write Would You Lay With Me In A Field Of Stone and Take This Job And Shove It. There were rumors that Paige died in the Jonestown massacre, but the truth was stranger. He went to Hastings, England where he became a medievalist named Count Edward MacDonald. Forsaking the guitar for the lute, he played at restaurants and medieval festivals. In June 2003, he was arrested for wounding a neighbor with a sword. Jailed for life, he was taken to Ashen Hill medium secure psychiatric hospital in Sussex, England. Customer evaluation for "Branded Man (CD)"